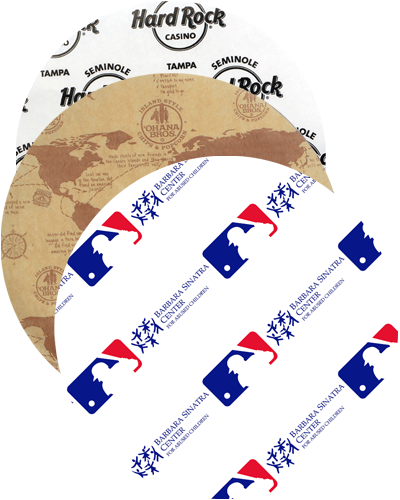 Custom printed Plate Liners are an exclusive product offered by Gator Paper. Plate Liners offer you the unique opportunity to brand your food in whole new way and are a great way to brand food plates, pizza trays and more. This unique food service sheet is available in several sheet types and sizes. Why use a standard square sheet when a round custom printed Plate Liner will make a much stronger impression with your customer? Custom printed Plate Liners say a lot about your business and your attention to detail. Our Custom Printed Plate Liners help deliver your branded message in a unique and memorable way! What is the minimum order for custom printed Plate Liners? 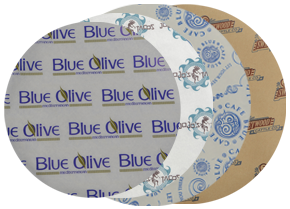 The minimum order for custom printed Plate Liners is 1 case = 2,000 circle sheets. Price breaks start at 3 cases. Standard lead times for custom printed Plate Liners is 6-7 weeks. Rush orders are available for an additional fee when the production schedule allows. Plate Liners can be printed with up to 2 spot PMS colors. We have the ability to add one 50% screen of each color for a total of 4 colors per print. All artwork submitted must be Vector. Adobe Illustrator, .EPS and high resolution PDF files are preferred. If the line artwork is simple enough, sometimes a JPEG file will work, however, Bitmap images are not good enough quality for proof or plate making, and are not accepted. Need a price quote on Custom Printed Plate Liners? Contact us today! Check out our new line of custom printed Retail Packaging. We now offer custom printed Wrapping Paper.